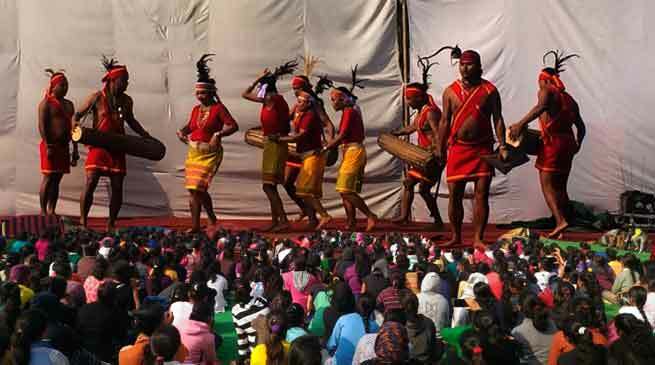 For the first time, now students of Delhi will have live glimpses of mosaic NE dances as a part of culture sensitization in Delhi schools by Delhi Police in collaboration with North East Council, informed Robin Hibu, Nodal Officer for North East People , Delhi. It has started on Thursday from JNU, DU schools. Delhi police had roped this unique initiative along with winter camps for self defence in schools of Delhi. Initially in the first phase, 9969 students of five schools will have privilege to witness it. Cultural troupe are from all 8 NE states based at Delhi and NCR, they will paid for the shows , transportation and refreshments under the aegis NE Special Police Unit. This shows will continue in schools in future also, hopes Mr Hibu. Enthusiastic responses with lot of queries by these students convinced my dogma that …..if you sensitise cities youth, we will be sensitizing future generation about rich cultural of NE people, said Mr Hibu. Mr Hibu said that “this will enhance their awareness about NE people, thereby strengthening the ethos of unity in diversity of our country. Thus will lessen the scope for racial discriminations, hate crimes and enhance national integration”.